In partnership with the City of Charlotte, The National Arts Program has focused on making recyclable art and fashion. As a unique way to open a door to other artists by providing them the opportunity to make recyclable art and fashion for sponsors of this venue, managers for this yearly art show are allowing for a collaboration among artists and clients which had not previously existed. Waste Advantage Magazine discussed with Sarah Danee McGee, Project Manager for the City of Charlotte Storm Water Services and Venue Coordinator for The National Arts Program, the goals of this exhibition. What is the National Arts Program? For 31 years, The National Arts Program®, based in Malvern, PA, has held annual exhibits in more than 450 major and minor cities throughout the U.S. To date, there are 86 exhibitions held within 38 states; the program displays around 15,000 pieces of visual art each year, demonstrating to the general public a human dimension of employees previously hidden, making it a vital part of the local cultural community. By giving individuals the opportunity to showcase their creative talents in their work environment, the program creates a sense of community within the workplace while boosting employee morale. In addition, by inviting artists of varying skill levels from youth to professional to participate, the program promotes a sense of confidence, self-worth and artistic accomplishment within the individual. This extraordinary exhibit of artistic talent is in the form of sculpture, paintings, photography and crafts by people who most likely would not otherwise have had such an opportunity. Give a little background on the city of Charlotte’s Recycling Program and Goals. In 2002, Mecklenburg County and local business leaders worked together to create the Source Separation Ordinance. This law requires Mecklenburg County businesses to recycle corrugated cardboard and office paper, and to separate these materials from the non-recyclable trash if generating more than 500lbs. per month of them. There are four full service recycling centers in Mecklenburg County. When and how did the partnership between city and the National Arts Program between the two organizations begin? In 2012, I became the venue coordinator for the National Arts Program Exhibition. In the years prior to being the coordinator, I had been an artist participant as an employee of the City of Charlotte. After participating in a local arts and craft venue in the Charlotte area with some success, I started a small art and jewelry business called Just Beautiful LLC. Through my business contacts I started making recyclable fashion for clients such as Opera Carolina. As my client list has grown there was an opportunity to open a door to other artists by providing them with the opportunity to make recyclable art and fashion for sponsors of this venue. Many of my clients have agreed to sponsor this yearly art show, allowing for a collaboration among artists and clients, which had not previously existed. 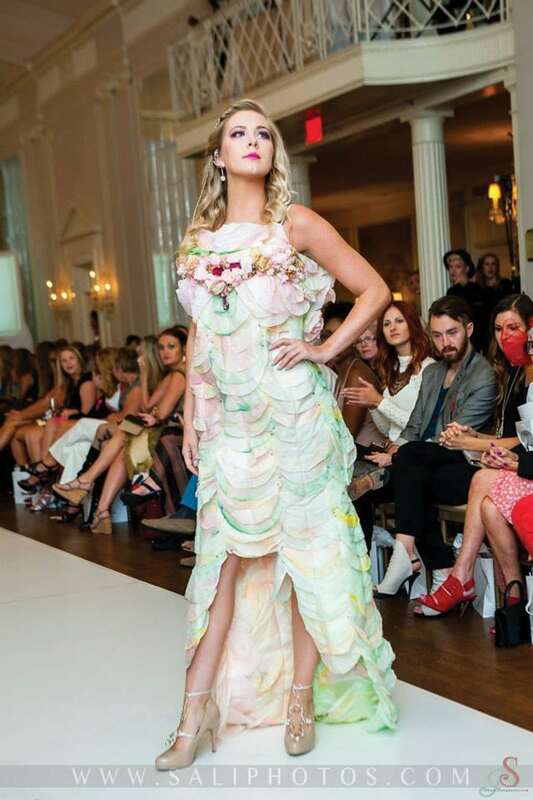 The hope is that these art and fashion pieces will be entered in recyclable contests throughout the Carolinas in an effort to promote waste reduction by unique and artistic means. Discuss the upcoming Recyclable Design Exhibit. What kind of things can people expect to see there? This annual exhibition, now in its 17th year, consists of works of art by the City of Charlotte, Mecklenburg County, Charlotte-Mecklenburg Schools and Library employees as well as their immediate family members. These artists will be submitting works of art consisting of photography, works on paper (pencil, watercolor, etc. ), paintings, sculpture and crafts. As a way of promoting our sponsors, which include The Arts and Science Council, Opera Carolina, Binders Art Supplies, Fast Frames/Dilworth Packaging and The Discovery Place, local artists will also participate in making special exhibits made of recyclable materials made from our sponsors’ old marketing materials. These exhibits will be in the form of pieces of art and fashion and will be displayed during the exhibition month. Where does the recycling material that these artists use come from? What, if any, kind of impact does it have on waste diversion, recycling process, etc.? We ask our sponsors, as they come onboard, to donate recycled material, which is turned over to the artists who will be making either a fashion or sculptural piece within a specified timeline. The artists have until the exhibition starts, January 31, to complete their pieces. We are expecting to use 300 pounds of marketing materials, which is approximately 4,000 pieces of flyers, brochures, mailers and envelopes. How long will the exhibit run? How many people do you expect? Will it be an annual effort? The National Arts Program exhibition is in its 17th year and the reception for this years’ exhibition will be on January 31, 2017 to announce the winners in each of the five categories: Adult Professional, Adult Intermediate, Adult Beginner, Teen and Youth. The exhibition is free to the public and starts on February 1st running through the last day of the month. Typically there are 500+ individuals who attend this gallery style exhibit. What do you see for the future of this event? The hope is to see our sponsorship grow and develop such that sponsors can use the recyclable art pieces made by local artists at their future discretion when our yearly exhibit ends. For more information, contact Danee McGee, City of Charlotte Storm Water Services and Venue Coordinator for The National Arts Program, at dmcgee@charlottenc.gov.